Khammam District Court jobs - Computer Assistants, Stenographer (Grade - III), Typist, Copyist, Junior Assistant,Process Server, Field Assistant, Examiner, Process Server, Driver Posts 2018: Khammam district various posts 2018, Application form, Hall tickets, Results, Last date for apply, Exam date and more details @ http://ecourts.gov.in/Khammam. 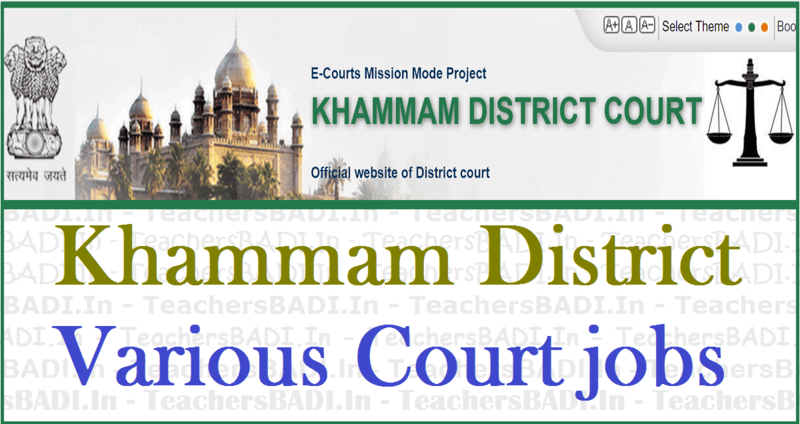 Khammam District Court Jobs, Office of the Principal District Judge, Khammam has given the various posts Recruitment 2018 notification and applications are invited from eligible candidates for appointment to Posts of Stenographer (Grade - III), Typist, Copyist, Junior Assistant,Process Server, Field Assistant, Examiner, Process Server, Driver under the A.P. Last Grade Service Rules in the Unit of District Judge, Khammam District, by direct recruitment. Qualification: Intermediate. Type English Higher, Shorthand English Higher and computer knowledge. Qualification: Intermediate and Computer knowledge. Qualification: Intermediate, Type English Higher and Computer knowledge. Qualification: Intermediate. Type English Higher. Qualification: Valid light motor vehicle driving licence with practical experience of driving motor vehicles for a period of not less than 3 years with endorsement to drive Motor Cycle and Auto-rickshaw. Qualification: VII Standard. Preference will be given to the persons who possess professional skills such as Electrical, Plumbing, Driving, Carpentry, Cooking, Dhobi etc. Qualification: VII Standard Examination. Preference will be given to the persons having qualifications of Electrician, Plumbing, Driving, Carpentry etc. How to Apply: Candidates shall submit applications in person in the counter of M/s. Sree Sairam Agencies, Khammam located in the premises of Hon’ble Principal District and Session Court, Khammam. Last date to apply: 09.02.2018. District and Sessions Court, Khammam invites applications for the recruitment of Computer Assistant vacancies on contract basis. Age limit (as on 01.07.2016): Between 18 to 34 years. Qualification: Intermediate examination. Must have passed and have sufficient Software & Hard ware knowledge. Selection Process: Based on written test/ interview, skill test. How to Apply: The applications should be addressed to the Principal District and Session Judge, Khammam. Last date for receipt of application: 25.02.2017. Age limit: Must have completed 18 years of age and must not have completed 34 years of age as on 01.07.2016. Qualification: 7th Class able to ride Bicycle. Preference will be given for professional skills, such as driving Carpentry, Cooking, Electrical, Gardening, Painting, and Plumbing etc. Candidates shall be able to read and write the languages or one of the language of the District (Telugu and Urdu). 8. Driver posts: 1. The candidate must be able to read and write Telugu and Urdu or English. 2. Must possess a current valid Light Motor Vehicle Driving Licence, issued by competent authority under the Motor Vehicles Act, 1988 with practical experience of driving Motor Vehicles for a period of not less than 3 years with endorsement to drive Motor Cycle and Auto-rickshaw.